Knowing how to cut and slice raw meat is a skill all omnivorous cooks need in their arsenal. However, raw meat's limp and gelatinous character can be challenging to work with, especially when you're trying to slice it into symmetrical, attractive sections for a stir-fry or a stew. Inexperienced cooks often end up sawing and hacking at the flesh, which leaves you with raggedy, sad-looking bits that don't cook up evenly. 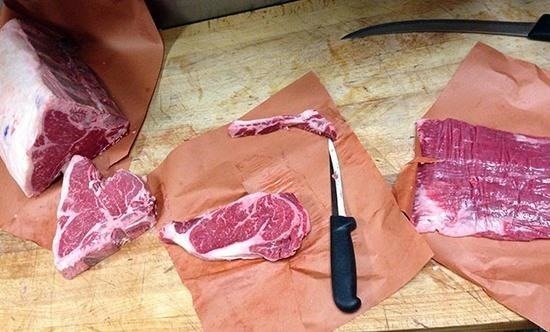 But there are two easy tricks that can help you cut meat so it's at its best, even if you don't own the best or sharpest chef's knife around (though a good sharp knife definitely helps). Popping any cut of meat—whether it's fish, chicken, beef, pork, or lamb—into the freezer until it's semi-frozen makes it a lot easier to cut. 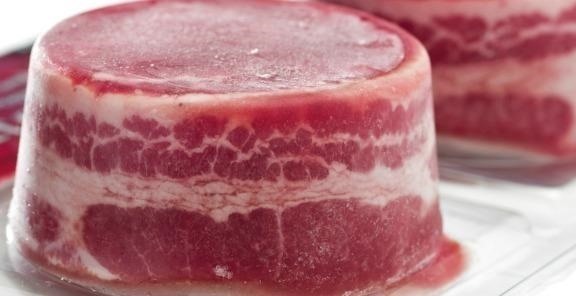 When the water inside the meat begins to turn to ice, it crystallizes, which in turn gives the meat more structure and firmness. Better Homes & Gardens suggests 45 to 60 minutes in the freezer for a 1-inch thick cut of meet. You can adjust this time proportionally (i.e, a 2-inch thick cut might take almost two hours). The meat should be firm to the touch, but not frozen solid. The surface should have some give, but you should not be able to easily leave a deep indentation if you push with your fingertip. Alternatively, you can take a cut of meat from the freezer and wait until it partially defrosts to the proper state, then slice it. 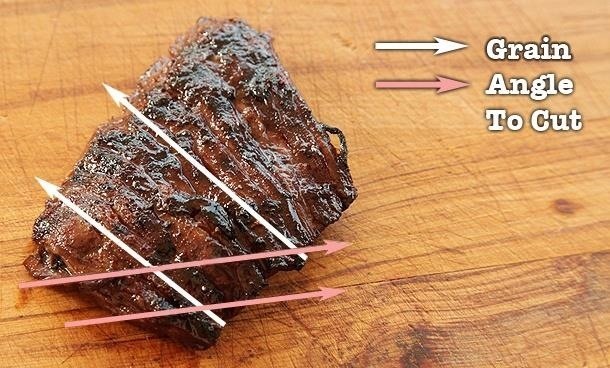 Why do almost all recipes about meat contain the instruction slice against the grain? Because it makes meat more tender. 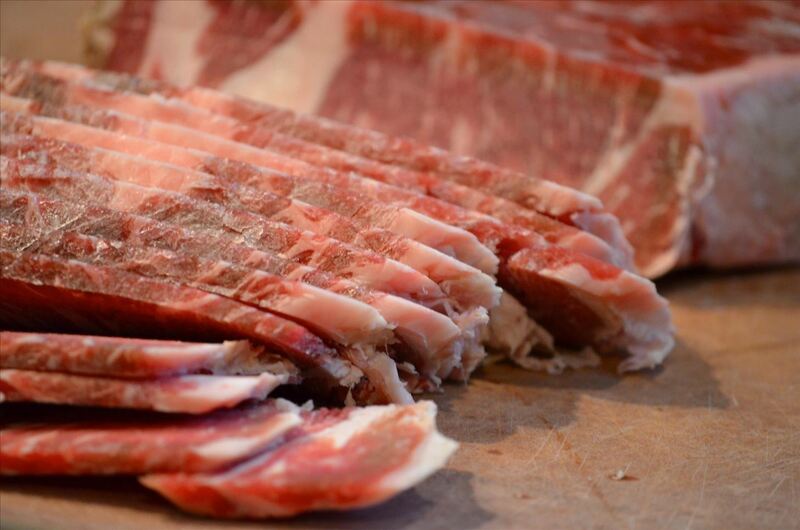 Meat contains muscle fibers that are stacked parallel to one another, just like a cord of wood. When an animal is alive, those muscle fibers have to be strong and tough in order to get the muscle to move. If you cut the meat along the length of those fibers, you increase the toughness. 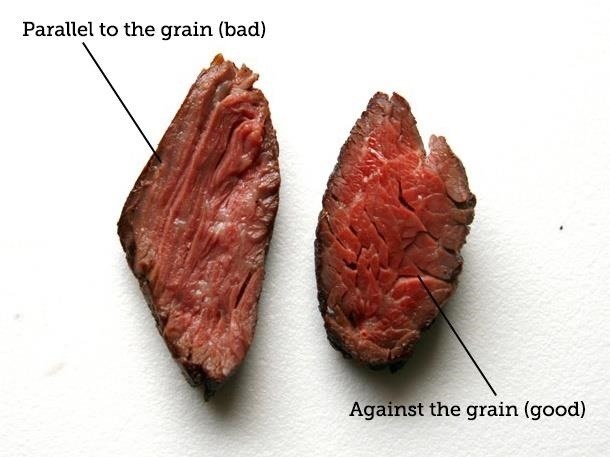 If you cut the meat against the grain of those fibers, you shorten them, which makes them more tender. This applies to both raw and cooked meats. Chef Matthew Wadiak explains it very nicely below. "Meat is a muscle. For a tougher piece of meat especially, that muscle is long and stringy. You don't want a long and stringy bite of meat. So when you cut against the grain of the muscle, you get hundreds of tiny fibers–instead of one long one. That makes the meat melt in your mouth." So, just remember—partially freeze your meat, and slice against the grain. Now you're ready to make the stir-fry of your dreams!